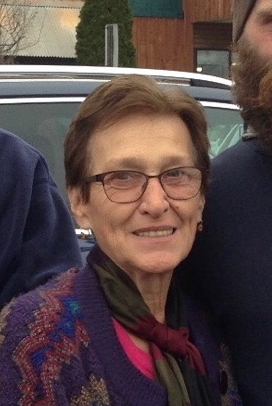 Marta Chomanczuk of Newburgh, NY died Friday, August 3, 2018. She was 69. Marta was born on September 7, 1948 in Arezzo, Italy, the daughter of George and Anna (Peruzzi) Hankewycz. As a young girl, together with her parents and her sister Maria, Marta emigrated to the United States in 1951 and lived in NYC. Later, on October 25, 1970 Marta had married Walter Chomanczuk in Kerhonkson. She was a member of Holy Trinity Ukrainian Catholic Church in Kerhonkson, She had graduated from Borough of Manhattan Community College with an Associate’s Degree in Accounting. Marta was talented artist with a passion for painting and playing piano. She loved gardening and cooking, and would make the best jams and other canned foods. Marta is survived by her husband of 48 years, Walter Chomanczuk. Her children; Antin Chomanczuk and his wife Sarah, Peter Chomanczuk and his wife Jennifer, and Marko Chomanczuk and his wife Shannon. Her grandchildren; Niklaus, Peter, Emily and Eden. Her brothers and sisters; Maria Hankewycz, Chrystyna Sinclair, Michael “Peter” Hankewycz, Stefan Hankewycz, Anya DeLuca and George Hankewycz. And many nieces and nephews. Visiting hours will be Tuesday, August 7th from 1-3 & 6-8pm at HB Humiston Funeral Home, Kerhonkson. The Panakhyda will begin at 7pm that evening. The Divine Liturgy will be Wednesday, August 8th 10am at Holy Trinity Ukrainian Catholic Church, Kerhonkson. Burial will follow at Pine Bush Cemetery, Kerhonkson. In lieu of flowers contributions may be made in Marta’s name to Holy Trinity Ukrainian Catholic Church, 21 Foordmore Rd, Kerhonkson, NY 12446.